Weaving has been a part of my life for as long as I can remember. My mother began teaching me at the age of eight. During my adolescent and teenage years, I spent many long and rich summer hours working at my loom in the local weaving shop, dreaming up new designs, patterns, and color combinations and weaving them into reality. At the time, I didn’t see anything special about it. 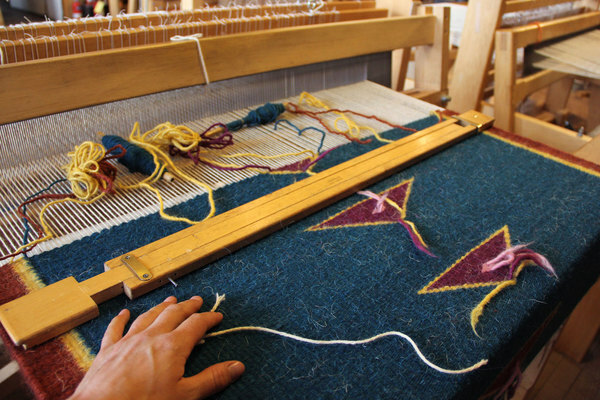 Weaving was just a part of life – like breakfast, or baseball practice, or summer thunderstorms. I would never think to take a picture of my breakfast each day, and I didn’t think to take photos of the hundreds of pieces that I wove over a period of seven or so years. All of the weavings went up for sale in the weaving shop as I made them, and they all quickly sold. I sometimes regret having taken so few pictures of my work… but at the same time, it’s kind of a neat idea to think that there are mysterious pieces of me in peoples’ homes across the country. It’s exciting to think that I could walk into a new acquaintance’s house someday and see one of my long-lost weavings hanging on their wall. I mean, wouldn’t that be wild? My sister and I run behind the family sheep under the watchful eye of the shepherd, Martín Romero.